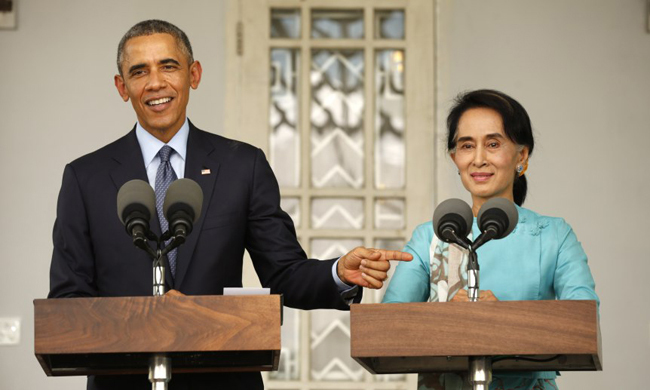 YANGON: Standing next to Myanmar’s democracy icon Aung San Suu Kyi, U.S. President Barack Obama said on Friday that the law barring her from becoming president “doesn’t make much sense”. It was the clearest statement Obama has made on Suu Kyi’s political future, but he stopped short of explicitly urging that changes be made to allow her to run for the presidency. Washington has pressed for more change in Myanmar, where political and economic reforms launched two years ago seem to have stalled and taken the sheen off what was seen as a rare foreign policy achievement for Obama. But it has signaled its willingness to let the transition take shape and has avoided specific demands. “I don’t understand a provision that would bar someone from being president because of who their children are – that doesn’t make much sense to me,” Obama told reporters outside Suu Kyi’s lakeside home in Yangon without naming her. Suu Kyi, like Obama a Nobel laureate, is barred from contesting for president in next year’s election because her two sons are foreign nationals. “From the point of view of democracy, it is not right to discriminate against one particular person,” she said of the law. Many believe the law on presidential candidates was written specifically with Suu Kyi in mind. She remains wildly popular and her party – which swept a 1990 vote that was ignored by the military – is expected to do well in next year’s election. Suu Kyi denied that she had differences with the United States over the transition process in Myanmar. “Our reform process is going through a bumpy patch,” she said. “But this bumpy patch is something we can negotiate with commitment and the help and understanding of our friends around the world. “When Burma becomes a fully functioning democracy in accordance with the will of the people, we will be able to say that among those friends who enabled us to get there, the United States was among the first,” she said, using the old name for Myanmar. Obama was on his second visit to Myanmar, where he attended a regional summit and held a bilateral meeting with President Thein Sein. After the meeting on Thursday, Obama said he was optimistic about political change in Myanmar, but that much remained to be done. Myanmar began its emergence from international pariah status in 2011 when military leaders launched reforms after nearly half a century in power and installed a quasi-civilian government. But substantial power is still held by the military, and that needs to be dealt with as the country makes the transition to a full democracy, Obama told a group of Myanmar lawmakers at a meeting earlier on Thursday.